Are pumpkins are not available as a PYO crop. Pumpkins are a member of the Squash family that were first cultivated in the America's before being bought to England by returning explorers. We grow a wide varieties of Pumpkins of all shapes and sizes from tiny munchkins to massive 'Atlantic Giants' we also grow a variety of different sizes of white 'Ghost' pumpkins. All of our pumpkins are outdoor grown without the use of polytunnels and exposed to the warm summer sunshine. This means that as well as being fun to carve, our pumpkins also have a great colour and fantastic flavour unlike the less expensive, intensively grown pumpkins commonly found on supermarket shelves. All of our Pumpkins are top grade and harvested by hand. Harvesting pumpkins by hand is a back breaking labour of love, but it's worth it! The end result is a better quality pumpkin with a nice long handle that has not been damaged or scarred by machine harvesting. You really can tell the difference! 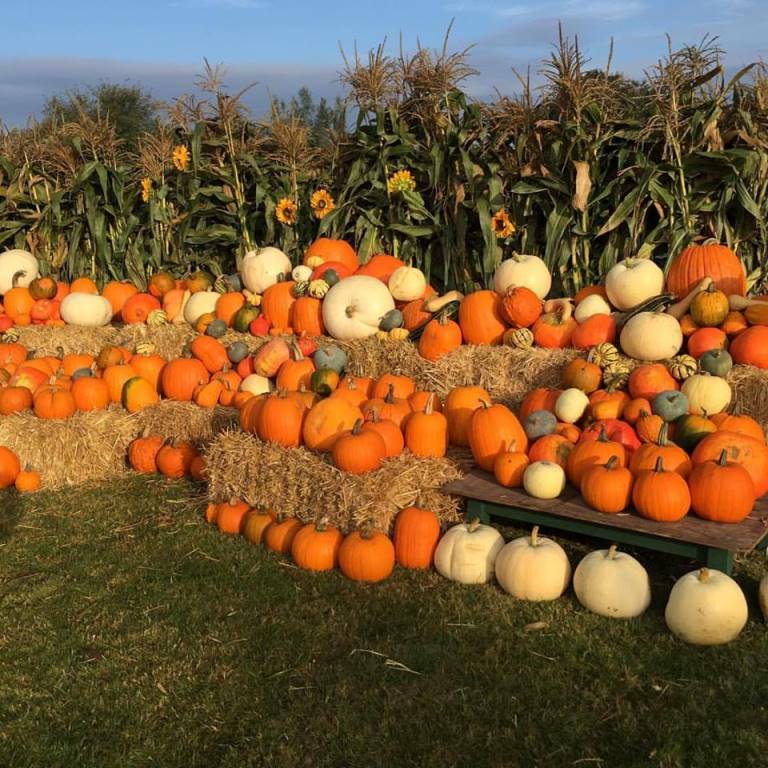 Every October our Pumpkin Patch Event opens in Crockford's Corner, this is not the same as our growing field, but a rather an American Style Pumpkin Patch where thousands of different sized pumpkins and squashes grown here on the farm are displayed for sale on tables and hay bales. Pumpkins will last for months if they are not cut into and stored correctly. Given that Pumpkin don't spoil easily, many of our customers prefer to vist early in October when we have the widest selection available. Don't carry it by the handle! As we don't have to pack our pumpkins into shipping containers we are able to leave them with lovely long handles, but these can be fragile, it's best not to hold pumpkins by their stalk. 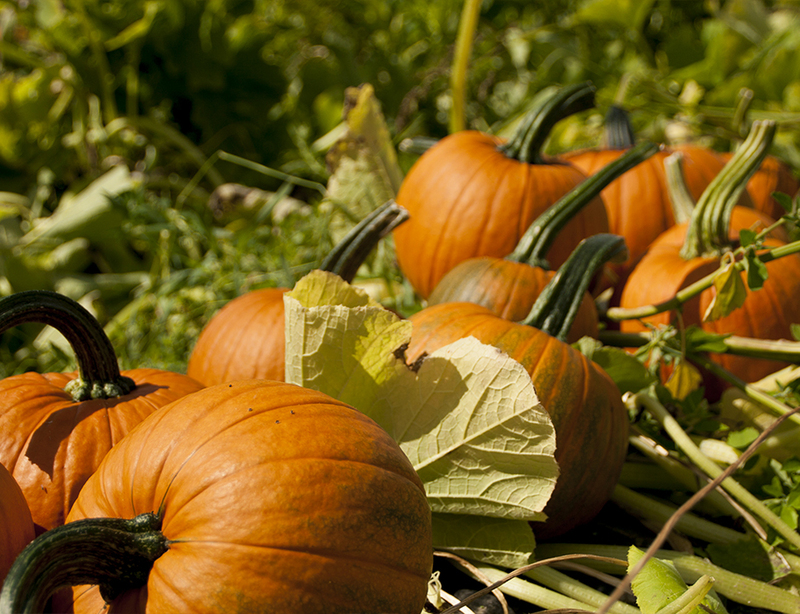 Store your pumpkins out of direct sunlight in a cool, dry environment until you are ready to carve or eat it. Traditionally gourds and squashes were safely stored this way to provide a source of food throughout the Winter months. Once your pumpkin is cut open it will begin to oxidise and spoil quite quickly. We recommend you leave carving your pumpkin as late as possible. Should you need to carve your pumpkin in advance, storing it in a fridge will help to slow down the spoilage. Some customers claim spraying the cut surfaces of pumpkins with a mild bleach solution helps preserve the pumpkin. The tradition of carving faces into pumpkins was thought to have originated in Ireland where faces were traditionally carved into turnips as part of the Gaelic festival of Samhain. Like many other crops, Pumpkins originate from Central America. Pumpkins can grow to massive sizes and in some parts of the world Pumpkin growing is a competitive sport. In 2016 a world record was set in Belgium with a pumpkin weighing 1190kg crowned as the worlds heaviest Pumpkin. The winners of these competitions can sell their pumpkin's seeds for thousands of pounds to growers and enthusiasts. 1 750g pumpkin, peeled, de-seeded and cut into chunks. 350g sweet shortcrust pastry. plain flour, for dusting. ½ tsp fresh nutmeg, grated. Place the pumpkin in a large saucepan, cover with water and bring to the boil. Cover with a lid and simmer for 15 mins or until tender. Drain pumpkin and let it cool. Increase oven to 220C. Push the cooled pumpkin through a sieve into a large bowl. In a separate bowl, combine the sugar, salt, nutmeg and half the cinnamon. Mix in the beaten eggs, melted butter and milk, then add to the pumpkin purée and stir to combine. Pour into the tart shell and cook for 10 mins, then reduce the temperature to 180C/160C fan/gas 4. Continue to bake for 35-40 mins until the filling has just set.